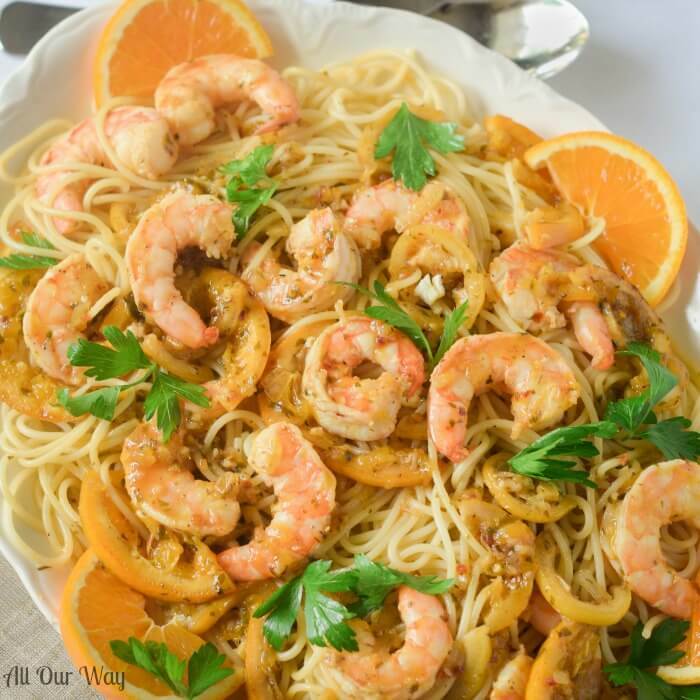 One pan orange lemon shrimp pairs garlic with bright citrus for a touch of sunny Capri. A light sprinkle of red pepper flakes and the lovely tang and sweetness of citrus infuse the shrimp with delicious flavor. Do you associate smells with time and places? I do! 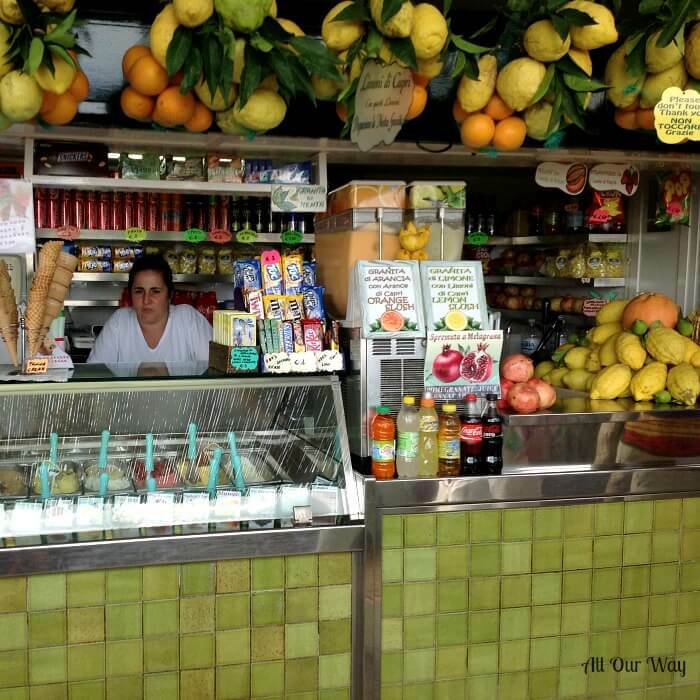 When I get a whiff of lemon or orange, I’m back on the Isle of Capri. The scent of citrus is everywhere. Besides the scent, there are mosaics, pottery, delicious dishes many with lemon and sometimes oranges themes. Check out Terrazza Brunella’s view and menu. They both take my breath away. All of the senses come into play here. The sight of the azure water, the sound of the beautiful Italian language, the magnificent aroma of fresh ingredients prepared into delicious dishes. Would you mind waiting for your food with surroundings like this? I doubt it!! We’re sorry we can’t serve up the view but our one pan orange lemon shrimp reflects the fresh taste and aromas that we found there. We had Gulf wild-caught shrimp in the freezer. All I needed to do was thaw out a package, remove the shell from the shrimp, and cut out the dark vein. I seasoned the shrimp with our Tuscan seasoning, covered the shrimp with plastic wrap, then placed them in the refrigerator. juice an orange and a lemon. measure out a pinch of red pepper flakes. 1 medium orange, cut into slices. 1 medium lemon, cut into slices. In a large skillet whisk together the olive oil, juices, garlic, onion, 1 teaspoon parsley, and the red pepper flakes. Bring the mixture to a simmer over medium heat. Cook about 4 minutes then add the orange and lemon slices. Add the shrimp and cook just until they turn pink about 2 or 3 minutes. Don’t overcook. Pour the citrus shrimp and citrus slices over prepared pasta. Sprinkle the rest of the chopped parsley over the top and serve. Garnish with orange slices. The taste is fresh and tangy with a touch of sweetness. If you like shrimp, this will become a favorite. It’s delicious, light in flavor, and a meal that is easy enough to make weeknights but elegant enough to prepare for company. An easy one pan meal that uses fresh wild-caught shrimp in a delicious, light, citrus sauce. The dish takes only minutes to prepare and we served it over pasta. A quick weeknight meal yet it's special enough for company. Makes 2 servings. 8 oz. pasta your choice made according to directions -- al dente! Make the pasta according to directions. Save 1/2 cup of the pasta water when pasta is done. Clean the shrimp and season. Cover with plastic wrap and place in fridge until ready to add to the other ingredients. 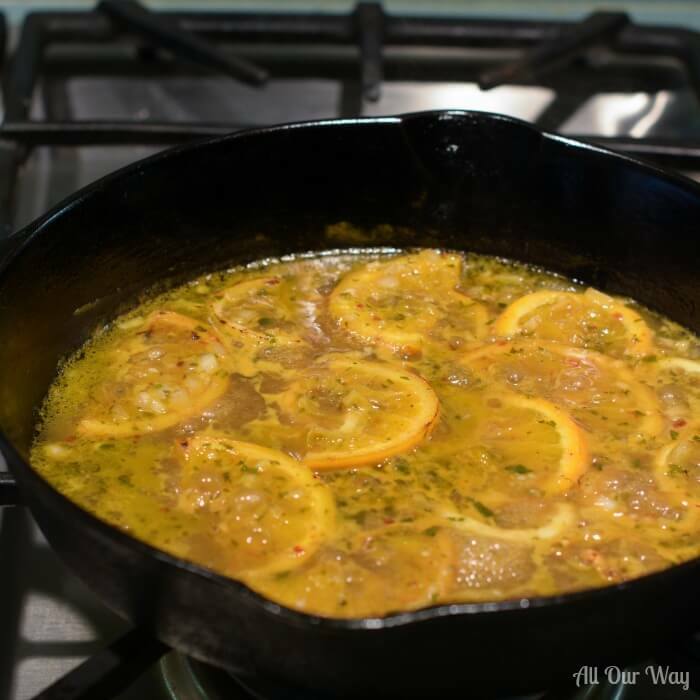 In a large heavy skillet, whisk together the olive oil, orange juice, lemon juice, garlic onion, parsley, pepper flakes, sliced orange, and sliced lemon. Over medium heat bring the mixture to a simmer and cook for about 6 minutes. the liquid will reduce by about half. Add the shrimp and season with freshly ground pepper and salt if your Tuscan seasoning didn't have salt in it. Stir and cook until they turn pink -- just a few minutes. **If you need more liquid in the sauce add a little of the reserved pasta water. Arrange on the pasta on a platter and pour the shrimp and sauce over it. 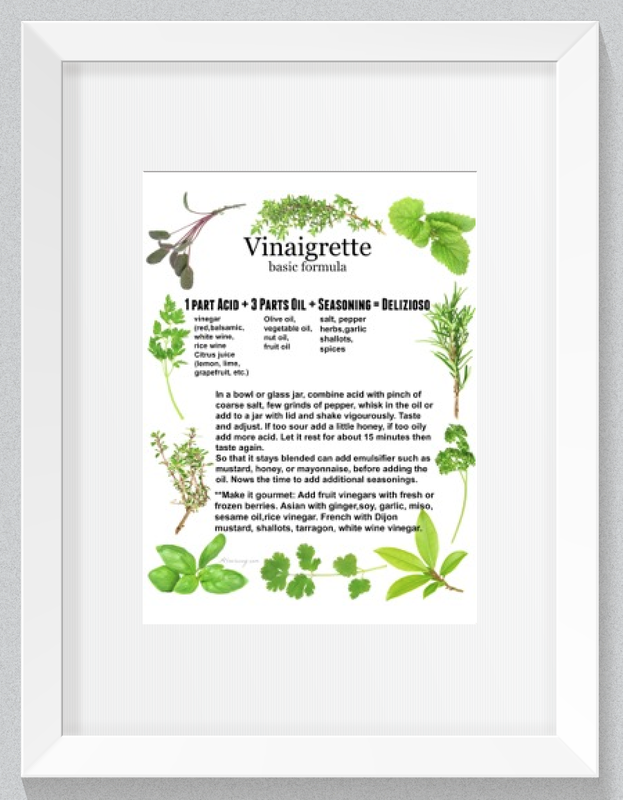 Sprinkle some fresh parsley leaves over the shrimp and garnish with orange slices. Let’s stay connected. Sign up for our weekly newsletter so we can share what’s happening with us and we’d love to know what’s going on with you. What’s cooking in your kitchen? Hi, Susie!! Glad you liked the video. The citrus shrimp is delicious!! Love and hugs to all. I am totally like you regarding associating places with the smell. I have lot of memories growing up with certain food and its smell. This recipe is so light and refreshing and the citrus flavors are just amazing. Love your travel pictures. Hi, Tammy! It does seem that shrimp and citrus seem to go together well. How your weather is warming up. 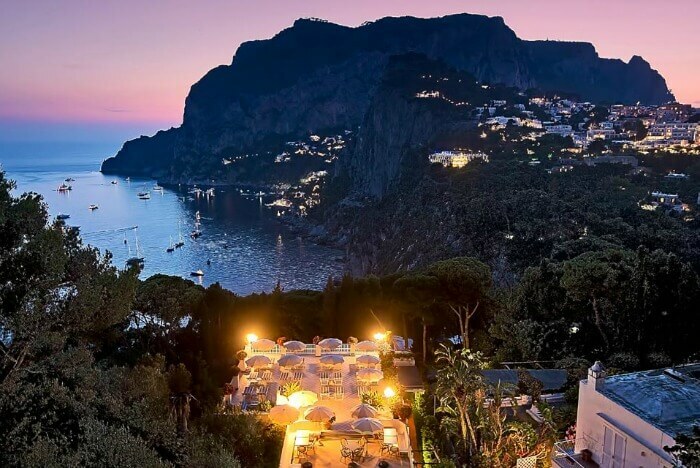 Now I want to go to Capri just for that wonderful food and view. 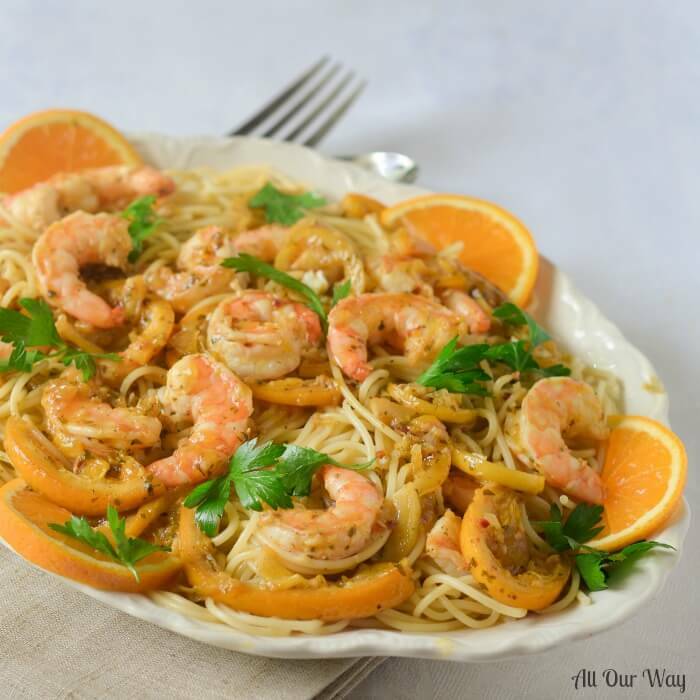 I love fresh citrus flavors in my meals and you one pan citrus shrimp sounds flavorful and fragrant. Thank you, Michelle. It certainly is a magical place! 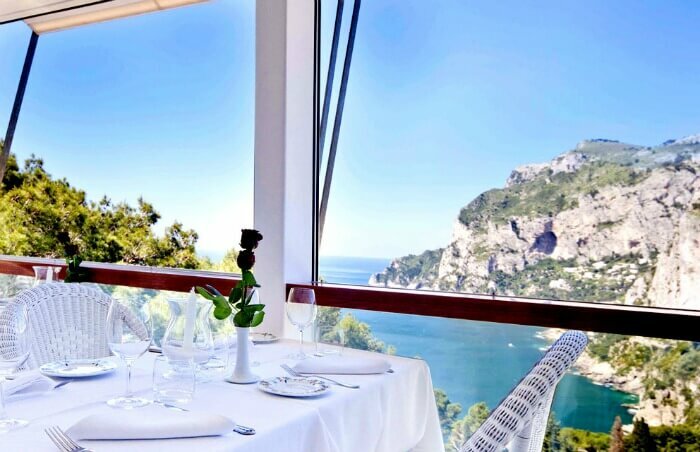 Now I want to go to Capri just for that wonderful food and view. 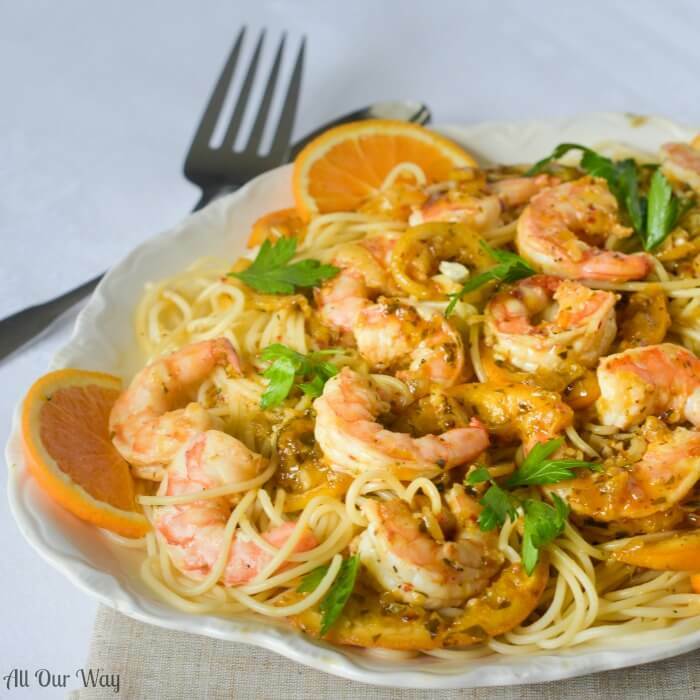 I love fresh citrus flavors in my meals and you one pan citrus shrimp sounds flavorful. How lovely is this! You brought me so many good memories of Capri. I went there last year and fell in love my favorite places I visited and those lemoncellos are amazing. Thanks for this recipe sounds really tasty. Oh that’s an interesting flavor !! I’ve never had orange and shrimp combination. I must try this. So yum! It’s a great combination, Veena! That little sweetness from the orange really makes a difference. Wow, just wow! I love pastas done with something citrus, or even a lemon cream. I’ll have to try this, the only problem is my husband who is sometimes against this combination. Which is bizarre…because there are definitely recipes incorporating lemon/citrus that are traditional Italian right? Right, Jasmine! Sometimes husbands can’t see beyond the traditional. You could say it’s a typical style recipe from the Isle of Capri. That might convince him 😉 or you could dream up some other way of convincing him! It’s really good. I can taste this fresh dish now…..Another great one pan meal……Fresh, fast and delicious! The pictures are beautiful, too. Hi, Susie! Hope you’re staying cool!! It’s almost too hot to cook but both those meals were pretty easy. We’ll have to get together a chat — going up to Indy this Saturday. Sending a lot of love and hugs. Oh my goodness. 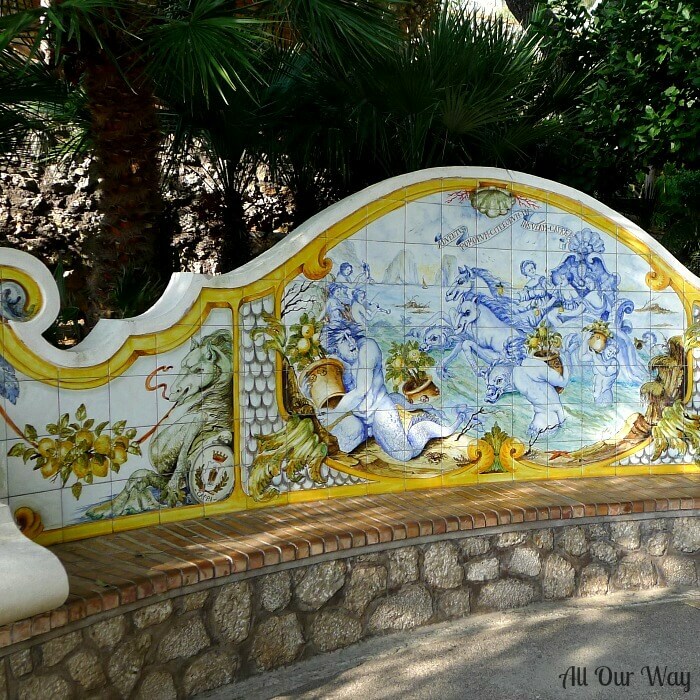 You’re making me long for Capri – or Portofino – or Sardinia – oh heck, I wanna be in Italy! Your pasta is also a beauty. 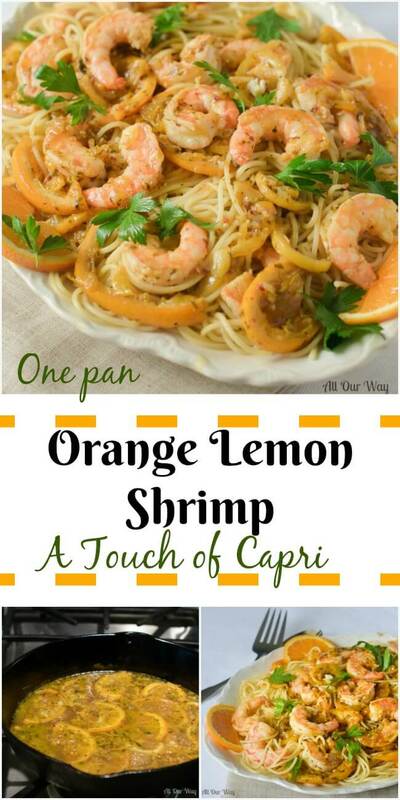 I never thought to pair oranges with shrimp or with pasta, but I will now! I know exactly how you feel, Linda. But you’re going to Lake Como!! I can’t wait to hear all about it. How I wish — what an inspirational site – but so is most of Italy. Try the citrus shrimp — it’s so good. You’ll like it! The only change I would suggest would be our sweet Georgia wild-caught Shrimp of course. Definitely going to have this soon. It would go great with all the Flounder George has been catching. I wish we could all be there overlooking the bay! The first thing the guys would want to do is go fishing — we could enjoy the great shops!! We are purchasing our fish — really sad. Hope to see you soon. Yum! 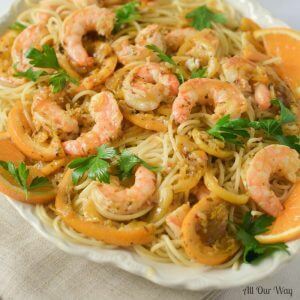 This orange lemon shrimp dish looks fabulous!! Beautiful photos of the vistas! Fun! Thank you, Elaine! It is a paradise and the restaurants there come up with fantastic recipes. Oh wow, Marisa, my favorite seafood in a fabulous sauce. Can’t get better eating than this. I can’t wait to try this recipe. I am sure we will love it.